The term "carat" is universally accepted for most gemstones as a measure of weight. (Jade is sometimes an exception as it has been traded for centuries by size). Not to be confused with Karat, which refers to the purity of gold. Carat is also often confused with size, even though it is actually a measure of weight. One carat is equivalent to 200 milligrams. One carat can also be divided into 100 'points'. A .75 carat emerald is the same as a 75-points or 3/4 carat emerald. A 1-carat emerald costs exactly twice the price of a half-carat emerald, right? Wrong! Since larger emeralds are found less frequently in nature, which places them at the rarest level of the Emerald Quality Pyramid, a 1-carat emerald will cost more than twice a 1/2-carat emerald (assuming color, clarity and cut remain constant). 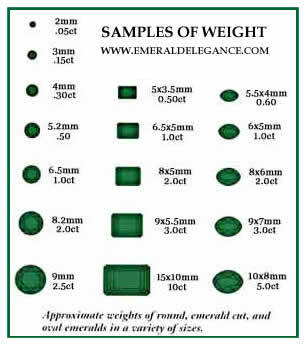 Since gems are comprised of different chemical elements, they do not all weigh the same, therefore, gemologists use weight as one means of identification. With emeralds you get a bigger jewel for the same weight as other major gems. Cut and mounting can make a Emerald appear larger (or smaller) than its actual weight. So shop around and talk to your jeweler to find the right emerald! It is worth noting that clean emeralds over 3 carats, with good quality get the best prices of the market, sometimes EVEN MORE THAN DIAMONDS! A gemstone is commonly measured in millimeters, based on the following formula: Length x Width x Depth. Experts are always looking at the dependent relationship between weight, dimension and shape. Due the exceptional formation of emeralds, in Colombia, Muzo, Chivor, Coscuez and La pita mines produce emeralds with different specific gravity. The finest emeralds contain the purest matter which results in bigger dimensions than other emeralds with the same carat weight, and when cut are smaller for in relation to their mass. The purity of the emerald does not influence the stone, only the weight of the stone, therefore we take this variable into consideration when valuing our stones. Light - Chivor mine, Gachala. Custom - Coscuez, La pita mine, and surrounding areas.